For other people with the same name, see Don Henderson (disambiguation). Donald Ainslie Henderson (September 7, 1928 – August 19, 2016) was an American physician, educator, and epidemiologist who directed a 10-year international effort (1967–1977) that eradicated smallpox throughout the world and launched international childhood vaccination programs. From 1977 to 1990, he was Dean of the Johns Hopkins School of Public Health. Later, he played a leading role in instigating national programs for public health preparedness and response following biological attacks and national disasters. At the time of his death, he was Professor and Dean Emeritus of the Johns Hopkins Bloomberg School of Public Health, and Professor of Medicine and Public Health at the University of Pittsburgh, as well as Distinguished Scholar at the UPMC Center for Health Security. Henderson was born in Lakewood, Ohio on September 7, 1928, of Scots-Canadian immigrant parents. His father, David Henderson, was an engineer; his mother, Eleanor McMillan, was a nurse. His interest in medicine was inspired by a Canadian uncle, William McMillan, who was a general practitioner and senior member of the Canadian House of Commons. 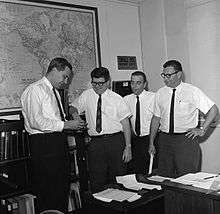 Henderson (first man on left) as part of the CDC's smallpox eradication team in 1966. Henderson graduated from Oberlin College in 1950 and received his MD from the University of Rochester School of Medicine in 1954. He was a resident physician in medicine at the Mary Imogene Bassett Hospital in Cooperstown, New York, and, later, a Public Health Service Officer in the Epidemic Intelligence Service of the Communicable Disease Center (now the Centers for Disease Control and Prevention — CDC). He earned an MPH degree in 1960 from the Johns Hopkins School of Hygiene and Public Health (now the Johns Hopkins Bloomberg School of Public Health). Henderson served as Chief of the CDC virus disease surveillance programs from 1960 to 1965, working closely with the inspirational epidemiologist Dr. Alexander Langmuir. During this period, he and his unit developed a proposal for a United States Aid for International Development (USAID) program to eliminate smallpox and control measles during a 5-year period in 18 contiguous countries in western and central Africa. This project was funded by USAID, with field operations beginning in 1967. The USAID initiative provided an important impetus to a World Health Organization (WHO) program to eradicate smallpox throughout the world within a 10-year period. In 1966, Henderson moved to Geneva to become director of the campaign. At that time, smallpox was occurring widely throughout Brazil and in 30 countries in Africa and South Asia. More than 10 million cases and 2 million deaths were occurring annually. Vaccination brought some control, but the key strategy was "surveillance-containment". This technique entailed rapid reporting of cases from all health units and prompt vaccination of household members and close contacts of confirmed cases. WHO staff and advisors from some 73 countries worked closely with national staff. The last case occurred in Somalia on October 26, 1977, only 10 years after the program began. Three years later, the World Health Assembly recommended that smallpox vaccination could cease. Smallpox is the first human disease ever to be eradicated. This success gave impetus to WHO’s global Expanded Program on Immunization, which targeted other vaccine-preventable diseases, including poliomyelitis, measles, tetanus, diphtheria, and whooping cough. Now targeted for eradication are poliomyelitis and Guinea Worm disease; after 25 years, this objective is close to being achieved. From 1977 through August 1990, Henderson was Dean of the Johns Hopkins School of Public Health. In 1991, he was appointed associate director for life sciences, Office of Science and Technology Policy, Executive Office of the President (1991–1993) and, later, deputy assistant secretary and senior science advisor in the Department of Health and Human Services (HHS). In 1998, he became the founding director of the Johns Hopkins Center for Civilian Biodefense Strategies, now the UPMC Center for Health Security. Following the September 11, 2001, attack on the World Trade Center, HHS Secretary Tommy G. Thompson asked Henderson to assume responsibility for the Office of Public Health Preparedness (later the Office of the Assistant Secretary for Preparedness and Response). For this purpose, $3 billion was appropriated by Congress. At the time of his death, he served as the Editor Emeritus of the academic journal Health Security (formerly Biosecurity and Bioterrorism: Biodefense Strategy, Practice, and Science). Seventeen universities conferred honorary degrees on Henderson. Fenner F, Henderson DA, Arita I, Jezek Z, Ladnyi. (1988) Smallpox and Its Eradication (ISBN 92-41-56110-6), Geneva, World Health Organization. The definitive archival history of smallpox. Henderson DA (1993) Surveillance systems and intergovernmental cooperation. In: Morse SS, ed. Emerging Viruses. New York: Oxford University Press: 283–289. Henderson DA, Borio LL (2005) Bioterrorism: an overview. In Principles and Practice of Infectious Diseases (Eds. Mandell MD, Bennett JE, Dolin R) Phil, Churchill Livingstone, 3591–3601. Henderson DA, Shelokov A (1959). "Medical progress: Epidemic neuromyasthenia—clinical syndrome". N Engl J Med. 260 (757–764): 814–818. Langmuir AD, Henderson DA, Serfling RE (1964). "The epidemiological basis for the control of influenza". Am J Public Health. 54: 563–571. doi:10.2105/ajph.54.4.563. Neff JM, Lane JM, Pert JH, Moore R, Millar JD, Henderson DA (1967). "Complications of smallpox vaccination: I. National survey in the United States, 1963". N Engl J Med. 276: 125–132. doi:10.1056/nejm196701192760301. Henderson DA. (1967) Smallpox eradication and measles-control programs in West and Central Africa: Theoretical and practical approaches and problems. Industry and Trop Health VI, 112–120, Harvard School of Public Health, Boston. Henderson DA (1972). "Epidemiology in the global eradication of smallpox". Int J Epidemiol. 1: 25–30. doi:10.1093/ije/1.1.25. Henderson DA (1975). "Smallpox eradication—the final battle (Jenner Lecture)". J Clin Path. 28: 843–849. doi:10.1136/jcp.28.11.843. Henderson DA (1976). "The eradication of smallpox". Scientific American. 235: 25–33. doi:10.1038/scientificamerican1076-25. Henderson DA (1998). "The challenge of eradication: lessons from past eradication campaigns (The Pittsfield Lecture)". Int J Tuberc Lung Dis. 2: 54–58. Henderson DA. (1998) The siren song of eradication. J Royal College of Physicians 32, 580–584. Henderson DA (1999). "The looming threat of bioterrorism". Science. 283: 1279–1282. doi:10.1126/science.283.5406.1279. Henderson DA; Inglesby TV; Barlett JG; et al. (1999). "Smallpox as a biological weapon: medical and public health management". JAMA. 281: 2127–2137. doi:10.1001/jama.281.22.2127. PMID 10367824. O'Toole T, Henderson DA (2001). "A clearly present danger: confronting the threat of bioterrorism". Harvard International Forum. 23: 49–53. ↑ Deans of the Bloomberg School. Johns Hopkins Bloomberg School of Public Health. http://www.jhsph.edu/about/history/deans-of-the-school/. Retrieved September 16, 2015. ↑ D. A. Henderson to Direct New Office of Public Health Preparedness CIDRAP News. November 6, 2001. Retrieved September 16, 2015. 1 2 Our Staff: D. A. Henderson, MD, MPH. UPMC Center for Health Security. 2015. http://www.upmchealthsecurity.org/our-staff/profiles/henderson/index.html. Retrieved September 16, 2015, 2015. ↑ Donald Henderson – Faculty Directory | Johns Hopkins Bloomberg School of Public Health. http://www.jhsph.edu/faculty/directory/profile/3691/donald-henderson. Retrieved September 16, 2015. 1 2 Breman, Joel (2016). 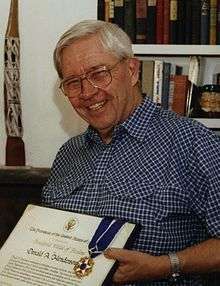 "Donald Ainslie Henderson (1928–2016) Epidemiologist who led the effort to eradicate smallpox". Nature. London: Springer Nature. 538 (7623): 42–42. doi:10.1038/538042a. PMID 27708300. 1 2 3 Williams, John. "D.A. Henderson, the former dean of Bloomberg School of Public Health credited with eradicating smallpox, dies". Baltimore Sun. Retrieved 21 August 2016. 1 2 3 4 5 6 Henderson, D.A. Smallpox: The Death of a Disease. Amherst, NY: Prometheus Books, 2009. p. 21. ↑ Henderson D, Klepac P (2013). "Lessons from the Eradication of Smallpox: An Interview with D. A. Henderson". Phil Trans R Soc B. 368 (1623): 20130113. doi:10.1098/rstb.2013.0113. ↑ Immunization, Vaccines and Biologicals: National Programmes and Systems. World Health Organization. 2015. http://www.who.int/immunization/programmes_systems/en/. Retrieved October 10, 2015. ↑ Immunization, Vaccines and Biologicals: The Expanded Programme on Immunization. World Health Organization. 2015. http://www.who.int/immunization/programmes_systems/supply_chain/benefits_of_immunization/en/. Retrieved September 16, 2015. ↑ D. A. Henderson to Direct New Office of Public Health Preparedness. CIDRAP News. November 6, 2001. http://www.cidrap.umn.edu/news-perspective/2001/11/d-henderson-direct-new-office-public-health-preparedness. Retrieved September 16, 2015. ↑ HHS Historical Highlights. US Department of Health and Human Services. 2014. http://www.hhs.gov/about/historical-highlights/index.html. Retrieved September 17, 2015. ↑ Statement of Tommy G. Thompson: Secretary, Department of Health and Human Services. US House of Representatives Committee on Energy and Commerce. Washington, DC: Assistant Secretary for Legislation, Department of Health and Human Services; 2015. http://www.hhs.gov/asl/testify/t011115.html. Retrieved September 17, 2015. ↑ Previous Medal Winners. Royal Society of Tropical Medicine and Hygiene. http://rstmh.org/awards/previous-medal-winners. Retrieved August 24, 2015. ↑ Public Welfare Medal. National Academy of Sciences. 2015. http://www.nasonline.org/programs/awards/public-welfare-medal.html. Retrieved August 24, 2015. ↑ The President's National Medal of Science: Recipient Details – Donald A. Henderson. National Science Foundation. https://www.nsf.gov/od/nms/recip_details.jsp?recip_id=165. Retrieved August 24, 2015. ↑ Laureates of the Japan Prize: The 1988 (4th) Japan Prize. The Japan Prize Foundation. http://www.japanprize.jp/en/prize_past_1988_prize02.html. Retrieved August 24, 2015. ↑ The Albert B. Sabin Gold Medal Award. Sabin Vaccine Institute. 2014. http://www.sabin.org/sabin-gold-medal-award. Retrieved August 24, 2015. ↑ Anniversary Discourse & Awards. The New York Academy of Medicine. http://www.nyam.org/fellows-members/awards.html#stearns. Retrieved August 24, 2015. ↑ Stanwell-Smith R (1996). "Immunization: Celebrating the Past and Injecting the Future" (PDF). J R Soc Med. 89: 509–513. PMC 1295915 . PMID 8949520. ↑ The Chiefs Order. Clan Henderson Society. 2013. http://www.clanhendersonsociety.org/the-chiefs-order/. Retrieved August 24, 2015. ↑ President Bush Announced the Recipients of the Presidential Medal of Freedom. White House Office of the Press Secretary. June 21, 2002. http://georgewbush-whitehouse.archives.gov/news/releases/2002/06/20020620-16.html. Retrieved August 24, 2015. ↑ Bush Honors 12 with Presidential Medal of Freedom. The New York Times. July 9, 2002. http://www.nytimes.com/2002/07/09/politics/09CND-MEDA.html. Retrieved August 24, 2015. ↑ President Ma Bestows Order of Brilliant Star with Grand Cordon on Professor Donald A. Henderson of University of Pittsburgh. Office of the President, Republic of China (Taiwan). July 4, 2013. http://english.president.gov.tw/Default.aspx?tabid=491&itemid=30401&rmid=2355. Retrieved August 24, 2015. ↑ Republic of China (Taiwan) Honors D. A. Henderson. UPMC Center for Health Security. July 8, 2013. http://www.upmchealthsecurity.org/about-the-center/pressroom/press_releases/2013-07-08_Henderson_Award.html. Retrieved August 24, 2015. ↑ Dr. Charles Merieux Award for Achievement in Vaccinology and Immunology. National Foundation for Infectious Diseases. http://www.nfid.org/awards/merieux. Retrieved August 24, 2015. ↑ Biography of Laureate. Prince Mahidol Award Foundation. http://www.princemahidolaward.org/laureate-bio.en.php?type=ind&id=2014-11-06%2015:26:17. Retrieved August 24, 2015. ↑ The Announcement for the Prince Mahidol Award 2014. Prince Mahidol Award Foundation. November 6, 2014. http://www.princemahidolaward.org/display-news.en.php?id=2014-11-06%2017:55:27. Retrieved August 24, 2015. ↑ Archives Reference: The Donald A. Henderson Collection in the Institute of the History of Medicine Library at Johns Hopkins spans his career in smallpox eradication, including newspaper articles, honors, biographical material, lecture notes, speeches, and correspondence as well as medals and other awards. ↑ A Web site www.zeropox.info provides some of the material in the archives and is rapidly expanding.